Injoy Motion Corporation (Injoy Motion) has long been devoted to the digital entertainment field. The company combines the technologies of 3D/VR, motion simulation, and mechanical design to develop a different series of motion simulators and simulation games. Moreover, by cooperating with academic institutes, Injoy Motion has even rolled out a brand new music game. Today, Injoy Motion has reaped well in Europe, North America and Asia and now it is prepared to extend its global promotion range to many new markets including the Middle East and Latin America. Founded in 2002, Internet Motion Navigator Corp (IMON) has developed and controlled many advanced technologies including its patented six-axis Hex-Glider in a short period. 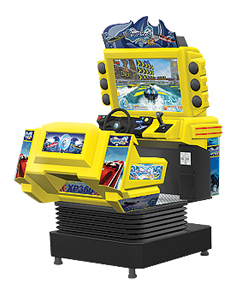 With such strength, IMON has developed several top-seller simulators such as “The 4th Generation of IMON Cruiser Motion platform”,“IMON Cruiser Double seats” and “2 axis x2/iGo.” These game machines have been sold to more than 20 countries across the globe. In 2007, an affiliate of IMON named Injoy Motion Corp was established. 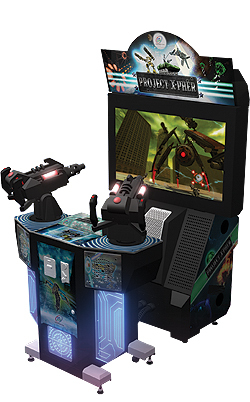 Injoy Motion devoted itself to the development of the digital amusement industry while IMON continued its focus on the simulation research and development for academic purposes and military training. By establishing the affiliate, IMON could clearly offer different service systems to further meet the needs from different groups of customers and listen to what the market wants to enhance their service. 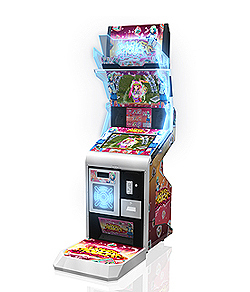 In order to combine their traditional edutainment game machine with motion simulation effect and function, Injoy Motion integrates its core technologies to create products with high-level of professionalism, depth and specifics and to shape the amusement game industry with a refreshed image. 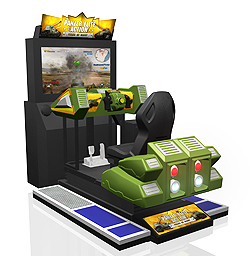 At IAAPA 2011 in Orlando, Injoy Motion released the prototype of a green-shaped tank game “Panzer Elite Action-Fields of Glory.” The game machine will be officially introduced to the market this year. 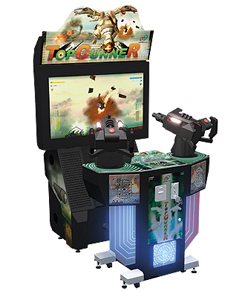 Cynthia Lai expressed that “Although ‘Panzer Elite Action-Fields of Glory’ is quite similar to ‘Panzer Elite Action DX,’ the former uses a closed cabinet and the latter is equipped with open seats and an H-shape handgrip. These two motion-based machines apply the same 2-axis design. Players still can feel the recoil right at the moment of shooting. Although the ‘Panzer Elite Action DX’ can bring more realistic controlling experience to the players, the open seat design applied by the ‘Panzer Elite Action-Fields of Glory’ can attract more crowds to give it a try. Moreover, with a friendlier price, ‘Panzer Elite Action-Fields of Glory’ would be a more favorable option to many venue operators.” Injoy Motion also provides choices of Multi Games. This product line shows the company is highly sensitive to the trends on the market and is able to make instant modifications based on the markets’ and customers’ demand. The latest version of “Project X-pher Series” has been released with some new design and streamlined appearance. This version moves the audio amplifier and footrest into the cabinet. All of these products are the main forces of Injoy Motion at this year’s GTI Asia Taipei Expo. The group will widely showcase these items on the show floor for the visitors and buyers to try. In addition to the above-mentioned products, “Love Touch” is Injoy Motion’s first music game. This game has been successfully made though university-industry cooperation. “It is a project in which Injoy Motion gave some general ideas and professors and students from academic institutions weaved out the rhythm, melodies and many other details,” said Cynthia. The testing model of the “Love Touch” was displayed at last year’s IAAPA and GTI Asia China Expo. 2011 was a special year for Injoy Motion. 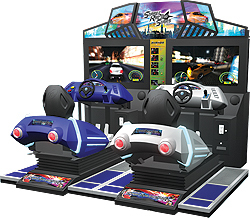 The company participated in Tokyo Game Show in Japan and displayed its products “Dido Kart series 2,” “Project X-pher Series” “Top Gunner” and “Infinite Joy.” As one of the small number of exhibitors that displayed large-size arcade machines, Injoy Motion’s simulators and amusement machines stood out amid a good number of online games, app games and video games. It was evident that taking part in the show had a positive effect on the firm’s expansion in Asia. According to Cynthia Lai, Manager of Injoy Motion, “Generally speaking, industry peers have a good impression on the quality of Made-in-Japan products. Being able to demonstrate products with Japanese companies at the same platform is actually a big confirmation to the quality of our products. We think we really make the best use of this exhibiting opportunity to promote the brand and products of Injoy Motion.” Injoy Motion also makes promotions in the Middle East, Turkey, and countries in Latin America such as Chile, Peru and Brazil. “The economies in these countries grow at an amazing speed. We will focus more on these markets that are full of potential. We have poured a good amount of resources in to these places. It is believed that we’ll start to reap benefits soon,” said Cynthia. Thus, in the second half of 2012, Injoy Motion has planned to exhibit at international trade shows such as GTI Asia China Expo in Guangzhou, IAAPA in the US, and Salex in Brazil to seek more cooperation opportunities. Last but not least, every year, Injoy Motion will launch new products at GTI Asia Taipei Expo. All of the firm’s products in different stages inherit the company’s developing spirit and core technologies. 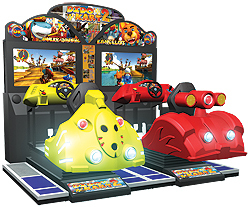 At the show, the firm not only can showcase self-developed products but also make communications with industry peers to bring more innovative and fun products to the amusement world.